“Star Wars: Dawn of the Jedi #1” cover. Writer: John Ostrander; penciler: Jan Duursema; inker: Dan Parsons; colorist: Wes Dzioba; cover artist: Gonzalo Flores. 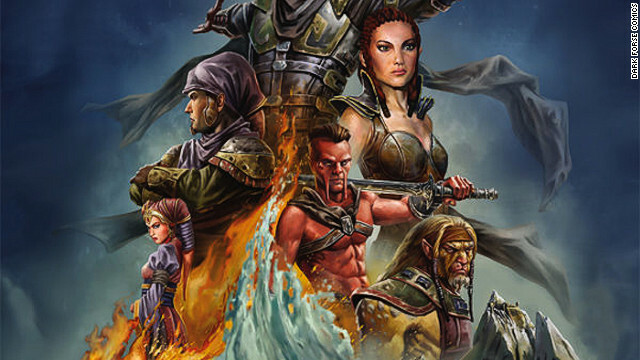 Dark Horse Comics and writer John Ostrander are teaming up again for “Star Wars: Dawn of the Jedi #1.” While the recently released MMO “Star Wars: The Old Republic” is set long before the events in the “Star Wars” films, “Dawn of the Jedi #1” is set earlier still (long, long ago, if you will), dealing with the very foundation of the Jedi order and the events that helped shape their philosophies. You can easily see a direct line between this story and story of Luke eventually finding Obi-Wan Kenobi in the deserts of the planet Tatooine. Our friend Daniel Dean from Titan Games and Comics in Smyrna, Georgia, has high hopes for the book. I'm a fan of new releases like comics, novels and video games that take thematic elements from the original “Star Wars” story but divorce them from the so-called “Expanded Universe” that acts as a sort of official timeline. It allows developers and writers to tell an engaging, multidimensional story using elements so familiar that even people who haven't seen "Star Wars" will recognize them - but without the audience feeling like they have to track down random other bits of “Star Wars” lore to understand and enjoy it. “Dawn of the Jedi” takes readers back to a time when adherents to the Jedi order learned this lesson the hard way. It shows how early events shaped the views, and future actions, of the order. This book offers a lot of good lore, a couple of “Expanded Universe” nods, an ominous antagonist and a big bad-guy throw-down. And of course we get John Ostrander, who has been writing “Star Wars” titles for Dark Horse for more than a decade. So, yeah, I think those five-a-week "Star Wars" customers might have just added a sixth book. Here are some of the comics scheduled to hit the shelves on February 15, 2012. Your local retailer will probably have these and others, so make sure to check with them for more details. Меня зовут Роман, я представляю партнерскую программу проекта "Как раскрутить продукт без денег". проекта "Как раскрутить продукт без денег"